Price: £5.29 each. £4.77 each if you buy two or more. P&P included. Also known as: 4SR44, V28PX, PX28, 544, KS28, RPX28, S1325S, S1325, PX28-S, 1406SOP. 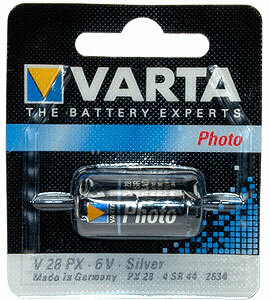 This 4SR44 or PX28-S battery is a popular silver-oxide cell are commonly used in cameras (such as the Minox 35ML, Bronica GS-1 and Cannon AE-1), light meters and blood sugar testers. The 4SR44 or PX28S batteries have a shelf life of 5 + years, so why not buy two or more. Take advantage of our reduced price and make sure you are not left without a camera next time your battery runs out. This Silver Oxide 4SR44 cell also has exactly the same dimensions as the Lithium PX28L battery which has a slightly longer life. * Actual manufacturer may vary depending upon availability. Currently stocking Exell brand.